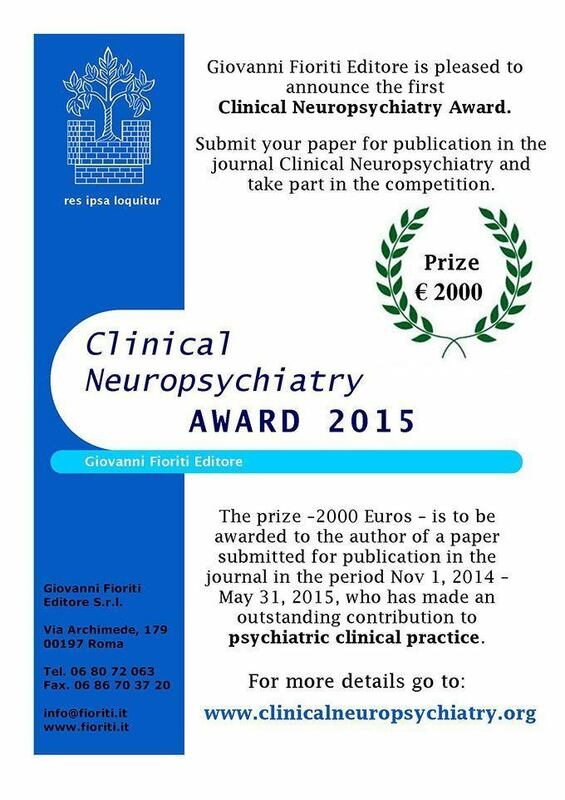 Giovanni Fioriti Editore is pleased to announce the first Clinical Neuropsychiatry Award. 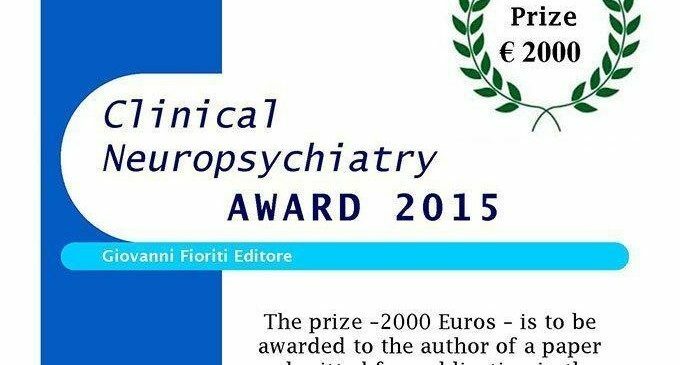 The prize –2000 Euros – is to be awarded to the author (-s) of a paper submitted to the journal in the period Nov 1, 2014 – May 31, 2015, who has made an outstanding contribution to psychiatric clinical practice. The winner (-s) will be selected amongst the research articles submitted for publication in CN with the highest impact on clinical psychiatry. Submitting a research paper for the Clinical Neuropsychiatry award. Send articles as usual and in agreement with CN instructions for authors in the period Nov 1, 2014 – May 31, 2015. Within July 2015, the award committee will complete the evaluation procedure and announce the winner. The prize will be awarded in September 2015. The evaluation committee is composed of the president Donatella Marazziti (editor-in-chief), Alessandro Grispini, Alessandro Serretti, Laura Mandelli, Michele Poletti, Adriano Schimmenti, Giuseppe Craparo, Leandro Malloy-Diniz, Alfonso Troisi. During the evaluation procedure even the referees could recommend an article for the award. Each member of the evaluation committee will choose articles suitable for the competition and discard those unsuitable articles (e. g.: review articles, editorial, research articles not related to clinical procedure etc. ), as all articles submitted to CN are judged by referees, but not all have the characteristics to participate in our award. A work judged acceptable only by one member of the evaluation committee will be excluded. A work judged acceptable by two members of the evaluation committee will be discussed. After this initial stage all works suitable for the award will be assigned a score from 1 to 10 by each evaluator while keeping in mind the aims of the competition. Importance of the clinical impact of a research paper conducted with a stringent, scientific method and being original. Each evaluator will assign a score according to his/her own personal knowledge and fields of interest. The decisions made by the evaluating committee are final and can not be contested at all.